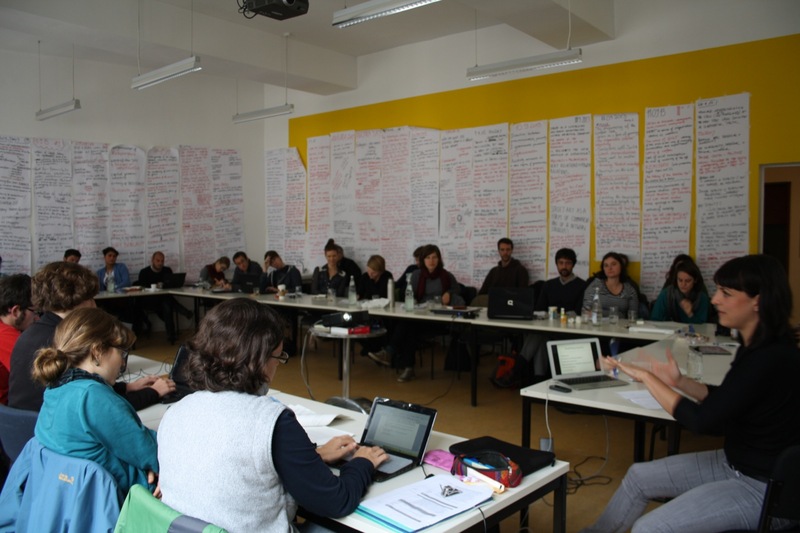 The summer school Expanding the Margins builds on the experience of Teaching the Crisis, the inaugural summer school which took place in September 2013 at the Institute for European Ethnology at Humboldt University in Berlin. Teaching the Crisis convened students and faculty from eleven countries and diverse disciplinary backgrounds spanning the social sciences and humanities, many of whom are participating again this year. The encounter was organized around a motivation to create a platform that would promote and examine critical, socially and culturally engaged research on the ongoing crisis in Europe. It moreover aimed to enable a process of collectively developing methods of research, teaching and learning that attend to the challenges posed by complex contemporary phenomena such as the European crisis to our standard protocols of knowledge production. Expanding the Margins builds on Teaching the Crisis both thematically as well as methodologically. This contribution explains the methodology of last year’s summer school and presents some results of Teaching the Crisis that are significant for our focus on migration, mobility and borders this year. As such it aims to highlight continuities between the two summer schools and suggest points of departure from which last year’s discussions can be continued and elaborated. The central component of the curricular program of Teaching the Crisis consisted in the task that all participating students conduct a group mini-study of crisis in their locality or region prior to the encounter. Methodologically this assignment was determined to facilitate a collective research and writing experience that would produce a series of reports conducted according to a common framework. The research process proceeded according to Protocols for Fieldwork disseminated to each participant in advance: Each research group was tasked with conducting a mini-study according to a research protocol provided months before the encounter, which prescribed the use of ethnographic mixed methods and the collection and evaluation of multimedia materials. As mini-studies the research could not take on the scope of ethnography, but the ethnographic inspiration was a critical factor of the assignment, aimed at the collection of empirical data and the engagement of social subjects with ethnographic mixed methods and an iterative principle: explore, reflect, question, return to explore, reflect, new question, etc. Crisis was the prescribed object of research, and attentive participants would have noticed the modifier ‘so-called’ before ‘crisis’ in the invitation to participate in the program. In this sense the knowledge object of Teaching the Crisis was destabilized before the actual encounter. In other words, crisis was implied in the summer school title, but called into question as a term or concept in the assignment to investigate it. Rather than creating analytical confusion, this seemingly incoherent or partial approach introduced another level into the methodology: the mini-studies themselves, insofar students independently chose topics they considered to relate to crisis, became empirical material for understanding the multiplicity of the meaning and experience of crisis in multiple disciplinary and social locations. From the assignment of conducting a mini-research on crisis in their local region, the student groups produced the following presentations and reports on the following themes. An evaluation of student presentations and ensuing discussions at the summer school reveals four main approaches to and concepts of crisis, each corresponding to a different use of crisis as a heuristic tool. First, student research groups from Lapland, Basel and Berlin stated their point of departure in terms of a lacking visibility or audibility of crisis. Their research process thus prescribed a critical approach to uncover social relations in crisis – that is, situations of conflict and the production of new oppressive/repressive relations – in their localities. In different ways, each group here came to the conclusion that crisis has been normalized in Finland, Switzerland and Berlin – crisis is normalized and ever-present in daily life and relations: as fear, as insecurity, as displacement (or ex-territorialization), which is then covered up. In simplified terms, each of these cases provided an account of crisis as both causal of and hidden by repressive governance. Second, the Athens research group identified crisis as the state of exception, as critical event, as biopolitical tool. In this rubric, “crisis management” is effectively the “production of a new order of intelligibility” affirming or rejecting identities as included or not in the social body or biopolitic. This approach to “crisis as state of exception” focused on the productivity or performativity of crisis as a trope that produces and legitimates the extension of state sovereignty. Third, student research groups from Ljubljana, Ankara and Madrid highlighted the emergence of new forms and situations of social resistance against neoliberalization and authoritiarian or non-democratic politics and new social organization. These approaches revealed crisis as a “chance” or “potentiality” for new social spaces and relations. Finally, the fourth approach could be identified in the presentation of the Bologna student research group, which examined recent strikes of the predominantly migrant workforce in the logistics sector in Northeastern Italy. The report raised questions of inclusion and exclusion in labor organizations and the mediation of the labor market by migration law. In so doing, it focused on crisis as the production and reproduction of capitalism in relation to living labor. One theme common to all student investigations was the politics of inclusion and exclusion, both in terms of attributing an increased socially perceived relevance to the question of belonging as well as with respect to transformations of the categories informing lines separating inside from outside. In other words, if we take our method seriously, then one result of Teaching the Crisis would confirm that borders have both become more significant and have been re-drawn during the European crisis. Given this result, the move from Teaching the Crisis to a second summer school entitled Expanding the Margins receives more weight. As we think in this direction, it is worth recalling the contours of the debate on the geographies of crisis that took place at least year’s summer school. Closely related to the concepts of and approaches to studying crisis (indeed, sometimes underpinning these) were geographical understandings of crisis and Europe. In somewhat simplified terms, two geographical concepts of Europe constituted poles of the discussion last year: one of Europe divided along North/South lines, informed by a center/periphery concept, and a “borderlands” understanding of Europe as a space traversed and constituted by multiple and complex relations[ii]. The former was especially present in rhetorics of exceptionalism. These were objects of student research in Berlin, Basel and Lapland, but the presence of the notion of exceptionalism might also be said to have been as specter at last year’s summer school, for even as it was an object of critique, it informed debates. To take one example, the student project in Berlin, while highlighting processes of financialization and urban displacement in Berlin, simultaneously made strong reference to the supposed location of Berlin (and Germany) in the “eye of the storm” of the European crisis. Contributions to a separate discussion about the reasons for the summer school taking place in Berlin reflected this tension. The critique of the North/South reading and an alternative concept were provided in Sandro Mezzadra’s introduction of his theory (together with Brett Neilson) of “border as method” – an attempt to show how the European and global spaces are criss-crossed by processes of territorialization and deterritorialization through conflictual re-drawings and erasures of borders (geographical, conceptual, legal, etc) that are productive of spaces governed by differentiated regimes. [iii] The Bologna student group moreover provided an example of how such a notion, together with other theories, can be mobilized in an empirical research project. Their creative method of reversing geographies was visualized through an upside-down map of Europe displaying Northeastern Italy as a harbor-space crossed by vectors leading around the Mediterranean and North African space, as a place of capture and processing on the path to the rest of Italy and northern Europe. Further, their invention of the term “Po Valley Region” to demarcate the territory of their analysis and the labor struggles they studied was an attempt to move beyond methodological nationalism and a center/periphery model. 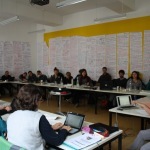 The second central methodological tool of the summer school consisted of a daily “Future Curricula” group exercise, in which faculty and students formed small groups following each day’s presentations and discussions with the goal of identifying, organizing and recording the central themes, concepts and questions that emerged in each day’s presentations and discussions. Key concepts and open questions were recorded on butcher paper hung up on the wall of the seminar room, so that all four walls were filled with records of previous days’ discussions by the end of the week. The organization and tasks of the Future Curricula group were similarly identified in a protocol provided to all participants in advance. During the program itself, the aim of this exercise was to create a cumulative space in which small groups could focus on specific questions of their own interest – a process that most frequently produced further questions. In the longer-term perspective of our undertaking, the purpose of this exercise is captured quite literally in the title “future curriculum group”. The intention was, with respect to the need for transnational, transdisciplinary, empirically motivated knowledge production in the social sciences and humanities at present, to begin developing research questions to guide future curricula. How can we talk about the European crisis without relying on categories informed by methodological nationalism? How can we research European space as socially embodied space in terms of processual rather than linear geographies? How do we deal with or what do we make of the persistence of the boundedness of discursive hegemony by nation-state borders? Why are we so good at understanding the commonalities of global capitalism and so challenged when it comes to understanding the commonalities of living labor? What new concepts do we have or need in order to discuss “old left issues” such as “leadership”, “consciousness”, “subject”? Where can we locate existing grassroots democratic decision-making practices and how can we study these so as to amplify their relevance for politics? How can our knowledge production contribute to the translation of subjectivities into institutional and organizational assemblages that would give continuity and coherence to emerging forms of social power? How do we study this if neoliberalism is the entrepreneuralization or responsibilization of community? Thinking about the earlier neoliberalization in Germany than southern Europe, the current geographies of European crisis and the temporality of debt as bringing the future into the present: How can we better study the relationship between temporalities and spatialities of crisis? Does debt also bring about territorial rather than only temporal displacement? What tools and concepts do we require in order to conduct analysis and produce theory beyond tropes of victimization (of dispossession) and romanticization (of resistance)? Can we find another epistemological perspective? Can deconstruction be a tool to go beyond dichotomy of salvation or nihilism? How to put deconstruction in relation to resistance as an epistemological standpoint? Is empathy a form and practice of sense-making? As is evident, last year’s summer school was a rich encounter that cannot be reduced to a few questions to be pursued at a further meeting. In our evaluation of Teaching the Crisis it was clear that the Future Curriculums groups were one of its most creative elements, producing an almost boundless array of open questions for further research. This year we are therefore continuing the exercise but under slight modification: participants will be asked to compose a response to one lecture or presentation, including ideas for future curriculum. In this way, we hope that participants can engage in this mutual, creative reflection in order to generate ideas that expand on existing research. [i] Luhmann, Niklas. Observations On Modernity. Stanford University Press, 1998. [ii] Balibar, Etienne. “Europe as borderland”, Environment and Planning D: Society and Space 27 (2009): 190-215. [iii] See Mezzadra, Sandro, and Brett Neilson. Border as Method, or, the Multiplication of Labor. Duke University Press, 2013.